“I am originally from the area around Aus that is famous for its wild horses, but for the past 20 years Keetmanshoop has been my home. These places are similar in many ways. They embody Namibia’s feeling of wide, open spaces and strong contrasts in landscapes that make the country and my region in particular very special. Culturally the Nama people enjoy traditional music called the “Nama stap”. It sounds good on the ear and we dance the “Nama langarm,” which is a desert version of the waltz. Nama women tend to dress very traditionally, particularly the older women, and their dress is a patchwork of beautiful, bright colours. With the colours of the desert so muted, it is nice to have these brightly dressed women dancing around! The people of the region, as far as farming is concerned, are split between strong communal and commercial farming. Strict conservation measures are in place where hunting only takes place during a certain season and or with a hunting permit. There are also special places to explore. Not far from Keetmanshoop is the Quiver Tree Forest. It’s a national monument, famous for its mass of “quiver trees,” a type of aloe that blooms beautifully in the southern hemisphere’s winter. 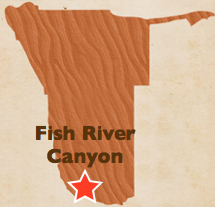 There’s Giant’s Playground, a mass of enormous rocks, but even more enormous is the second largest canyon in the world, the Fish River Canyon. The vast spaces and clean, fresh air of the south compliment my hobbies of running and hiking. That is by far the strongest inspiration I get from my region, and it even inspired me to run the recent Fish River Ultra Marathon, a 100-kilometre race through the Canyon!